Join TopBet today and not only will you be rewarded handsomely with some massive bonuses and potentially lucrative promotions, you also get first rate customer service, competitive betting odds, and fast payouts. A Match Bonus bonus of up to 100 percent that’s easy to understand and collect is available to all new clients when they make their initial deposit. Accepts real money players from the U.S. When you join TopBet you have a choice of three deposit bonuses which award between 50 per cent and 100 per cent of your initial deposit amount. A Match Bonus bonus of up to 100 per cent that’s easy to understand and collect, is available to all new Topbet clients when they make their initial deposit. Deposit between $50-$99.99 and you'll garner a 50 per cent bonus. Put between $100-$199.99 into your account and that gets you a 75 percent bonus. But any deposit between $200-$1000 is matched at a 100 per cent rate. Betting on sports to complete your rollover requirement requires a competitive 5x rollover, while casino games command a 25x rollover. There are a variety of options for depositing at TopBet. Credit cards such as Visa and MasterCard are acceptable, as are checks, Money Gram, Quick Cash, Western Union and Bitcoin. The minimum deposit is $50, with the maximum deposit being $1,000. 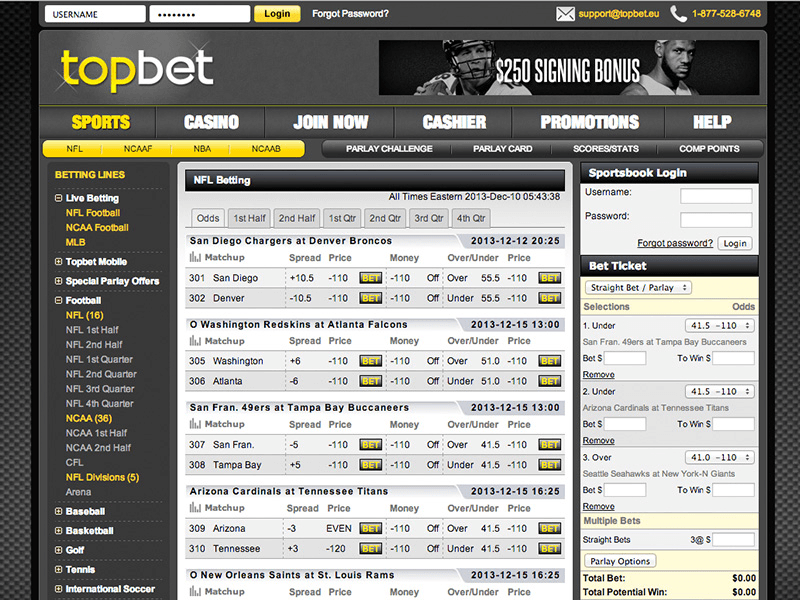 The TopBet website looks professional and clean, even if it is missing some of the fancy graphics of some of its rivals. Those are only the aesthetics, so do not pin too much on those when choosing a sports betting site. What you should be looking for are the selection of betting markets available, and the betting lines of those markets. TopBet has an abundance of both. At TopBet, you’ll find betting odds on football, baseball, basketball, international soccer, tennis, NASCAR, MMA, hockey, boxing, and even some fun entertainment bets on events like the Oscars. There are dedicated sections to NFL, NCAAF and MLB odds, the markets where TopBet seems to place its most emphasis. Signing up for an account is easy, and once you have entered a few personal details you will be ready to make a deposit and claim your bonus. Withdrawals are processed as a check via courier. The first one each month is free but then afterward commands a $40 fee. Other methods include cash transfer and money transfer. Should you get lucky and win big, a bank wire payout can be an option. Top Bet has been around since 2011 and is licenced and regulated in Curacao, formerly known as the Netherlands Antilles, a tiny country on the map. Don’t let that put you off. Obtaining a licence here is expensive, meaning that if a site is operating from those shores they are likely to be fluid and not have issues with paying withdrawals. The minimum deposit at TopBet is $50 and depositing this amount as your first-ever deposit yields a 50 per cent, which means the minimum bonus you receive is $25. The biggest bonus you can receive is $1000. To get this bonus, you will need to deposit $1000 into your account. Current rollover requirements at TopBet stand at 5x and include the deposit amount. This means if you deposit $250 and receive a $250 bonus, you need to wager $2,500 before you can withdraw any of the bonus money or proceeds from it. TopBet does alter its rollover requirements for reload bonuses, which are often lower due to the percentage on offer being smaller. The current welcome bonus does not require a bonus code, as you claim the bonus from within your account when you have entered all of your details. When it comes to reload bonuses around major sporting events there is usually a bonus code required, so check the promotions tab on the TopBet website for the latest offers and betting codes. TopBet offers a superb casino experience that plays directly in your computer’s internet browser, which means you do not have to download any software to use it. You simply log into your TopBet account and get ready to play some exciting casino games. A welcome bonus of 100 percent similar to what is offered in the sportsbook is available to new TopBet casino players, and this has a 25x rollover requirement. Another perk for newcomers is that TopBet will offer you a $5 free play in their casino if you have never played there before. Members also get free entry in any of TopBet's casino tournaments, and every time you take a pull on a slot machine of are dealt a hand of Blackjack, you gain points in the TopBet casino cash back rewards program. One of the more popular TopBet sportsbook promotions is the $10 Monday Night NFL Free Bet, which gives you the chance to place a free $10 bet on any NFL game. In the summer that turns into a $10 free bet on Sunday night Major League Baseball. Imagine turning that free $10 into something huge over time. Now stop imagining and start trying to make it happen! TopBet also offers a free $10 bet on NBA games every Thursday. Another promotion currently running at TopBet is the free couriered payout. When you come to make your first withdrawal from the site, TopBet offers to send it to you via courier completely free of charge. It is also worth following TopBet on Facebook and Twitter because they run free contests for some of the weekend’s most anticipated matchups, often rewarding free bets or special odds for fans of their social media channels. Close Visit TopBet and see for yourself... Ok! Let's Check Out TopBet!